The powerful deep fascia of the thigh (fascia lata) is connected to the lower aspect of the whole length of the ligament, making it convex inferiorly by its pull. 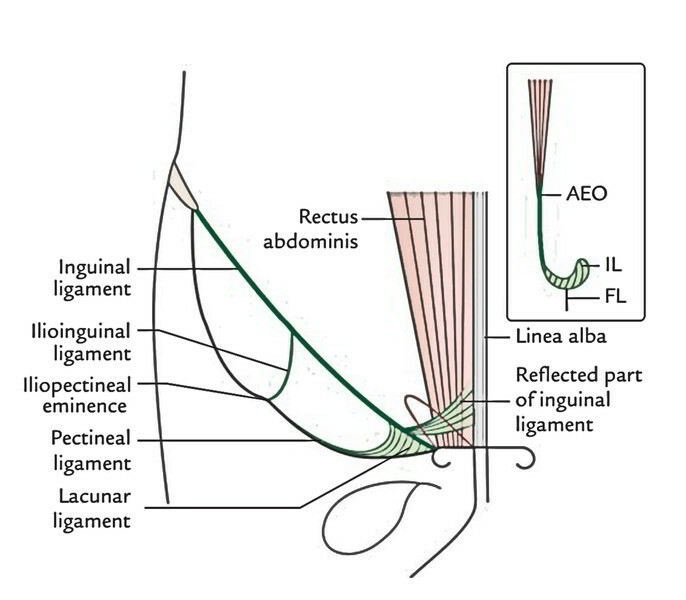 From the medial end the deep fibres of the inguinal ligament curve horizontally backward to the medial part of the pecten pubis creating lacunar ligament. 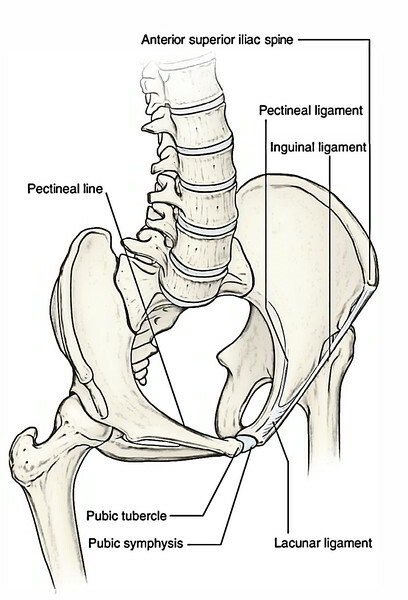 This ligament is triangularin shape with apex connected to the pubic tubercle. Its sharp lateral border creates the medial boundary of the femoral canal, which is the site of generation of a femoral hernia. It’s the extension of the posterior part of the lacunar ligament along the pecten pubis up to the iliopectineal eminence. Some authorities regard it as a thickening in the upper part of the pectineal fascia. The superficial fibres from the medial end of the inguinal ligament enlarge upward and medially to create this ligament. It is located behind the superficial inguinal ring and in front of the conjoint tendon. Its fibres interlace with those of its counterpart of the opposite side in the linea alba. It’s a fibrous band extending from the inferior aspect of the inguinal ligament to the iliopectineal eminence. Large lateral part named lacuna musculorum. Small medial part referred to as lacuna vasculorum. The iliacus and psoas muscles, and femoral and lateral cutaneous nerves of thigh go through the lacuna musculorum behind the fascia iliaca. The external iliac vessels in abdomen become femoral vessels as they go through the medial part of the subinguinal space- the lacuna vasculorum. The fascial lining of the abdomen is prolonged into the thigh to enclose the upper 3.75 cm of the femoral vessels creating the femoral sheath.